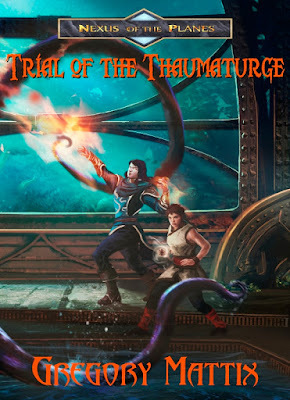 Trial of the Thaumaturge, the epic conclusion of Scions of Nexus, is now available!! Get it on Amazon and read for FREE with Kindle Unlimited! Time is slipping away for the Kingdom of Ketania, now under siege and teetering on the brink of destruction, following a crushing military defeat at the hands of Nesnys’s invading army. Queen Sianna Atreus has been captured, and the heroic rescue effort mounted by Dakarai Creel has failed. Taren and his companions, Mira and Ferret, return from Nexus to discover the Balance has shifted dramatically and the fate of the kingdom lies in their hands. Taren’s magical talents have flourished under the Lady of Twilight’s tutelage, and he’s grown in both power and control, yet he faces an impossible test against overwhelming odds. The heroes and their allies must rally the kingdom before the sinister plans of Shaol, Lord of the Abyss, come to fruition. To stop Shaol’s minions, they must journey to long-forgotten planes, racing against time while battling Nesnys’s forces every step of the way. Bound together by friendship, loyalty, and duty, the companions soon discover that the price of victory may prove to be the ultimate one.